Oh, yes, and the upgrade guide as well! Planning and performing a Visual Basic 6.0 migration is not that straightforward. You need to keep track of many small details, and you need to keep in mind the complete migration process – in other words, always see the big picture. 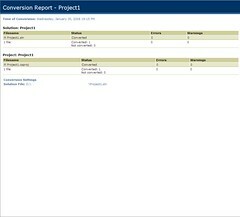 The tool I posted about yesterday, the Code Advisor and the Assessment Tool, are invaluable in the help that they provide during the planning stages of the project. For the complete upgrade process, however I have to recommend the Upgrading Visual Basic 6.0 Applications to Visual Basic .NET and Visual Basic 2005 guide from the patterns & practices Developer Center over at MSDN. This guide was written as a joint effort between Microsoft and ArtinSoft, and details all the steps necessary to succesfully upgrade your applications to Visual Basic .NET. 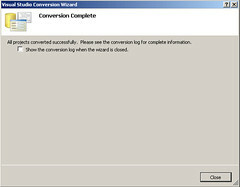 It also deals with the actual technical hurdles you normally face when performing these types of conversions. Overall it is very comprehensive, and should be in your library if you ar planning or performing one of these projects. If you are using the VB Upgrade Companion, and decide to upgrade to C# instead, most information from the guide still applies. That is one of the beauties of the .NET Framework – the concepts from VB.NET work with C# as well. And don't forget the Assessment Tool!!! Yesterday I blogged about the Code Advisor, that will pinpoint common programming practices that difficult the migration of a VB6 application. Well, another very important tool that you can add to your arsenal is the Visual Basic 6.0 Upgrade Assessment Tool. This tool was developed by ArtinSoft, and creates a spreadsheet with detailed information of actual upgrade issues that will be present in the .NET code after the migration. This tool is also a free download from Microsoft’s website. You can also check out ArtinSoft Visual Basic to .NET page for more information on upgrading Visual Basic 6.0 applications. The Code Advisor for Visual Basic 6 is an add-in used to review your code to ensure that it meets predetermined coding standards. The coding standards are based on best practices developed by Microsoft to produce robust and easy-to-maintain code. The Code Advisor detects issues that are not converted automatically during the automatic migration, increasing the manual work required after running the conversion tools. These include Variant variables, late binding, soft binding of different objects, and others. 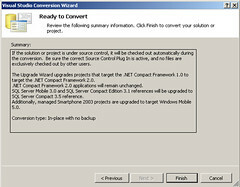 Even though the upgrade companion performs the conversion automatically, there are times when the protoype of the function may be slightly off. This happens mostly because of the changes in the data types between VB6 and C#. One example is when a string is sent to a method and its contents are modified in the call. String management is always tricky, and, in those cases, chances are that the VB Upgrade Companion will convert the VB6 fixed length string to a System.String object in C#. The correct conversion would be a System.StringBuilder object – remember that Strings are inmutable in C#, but StringBuilders are not, and they can be marshalled to the API as the strings that need to be modified. If you ever have a doubt regarding the prototype of a Win32 API function in C#, I recommend that you check out PINVOKE.NET. This website contains the P/Invoke signatures for most methods of the API, classified by DLL. It is very complete, and can definitely save you lots of time if you are having problems with a particular methods. If you are new to p/invoke, I also recommend that you check out this MSDN article on the subject. One of the best features of the Visual Basic Upgrade Companion, Enterprise Edition, is the fact that it transforms your ADO code into ADO.NET. The Companion converts most of ADO features automatically, and it work correctly even if you choose to generate C# code. 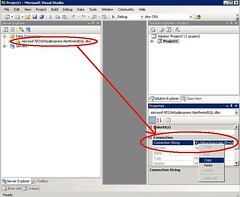 One detail, though, is that the generated code by default uses the SQL Client for ADO.NET connections. This brings huge performance increases to the application, but we’ve run in to the situation in the past where the original datasource was not SQL Server. We’ve seen applications that used the Jet Database Engine, which is no longer supported by the latest version of MDAC, and is definitely not supported by ADO.NET’s SQL Client. It is also important to mention that this and most other behaviors can be customized through our consulting services. We can also carry out the complete migration process as well. My coworker Hendel Valverde will be presenting a webcast called Complete Methodology for Migrating Microsoft Visual Basic 6.0 to Visual Basic .NET, tomorrow at 1:00 PM Pacific. It covers all the steps necessary to prepare and perform migrations from VB to VB.NET, from what to look for during the analysis and planning stages to the final testing of the migrated application. And here’s the link to ArtinSoft’s press release: ArtinSoft and Microsoft Announce New Webcast on VB6 to .NET 2005 Migration Methodology. Question: What happens with VB6 applications that use Spread? Answer: FarPoint's Spread is a widely-used spreadsheet component used in VB6 applications. The current version of the Upgrade Wizard does not support the automated conversion of this component to the .NET equivalent. If you wish to continue using it, you’ll need to use COM interop. There’s a chance that a future version of the VB Upgrade Companion Edition will be able to convert this component. 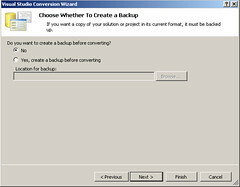 Question: Does the Upgrade Wizard work for upgrading ASP applications? Answer: No, it doesn’t. For ASP applications, there is the ASP to ASP.NET Migration Assistant. You can also check out the ASP to ASP.NET v1.x Migration Guide. It is slightly outdated and doesn’t deal with the 2.0 Framework, but should work as a good starting point. Artinsoft also offers complete migration services for upgrading your ASP application to ASP.NET. Question: Is there a solution for migration from Visual Foxpro to .NET? Answer: Unfortunately there is no tool for migrating Visual Foxpro applicationsto the .NET Framework. Question: Is there a document with and outline of the testing process for migration projects? Answer: The testing process depends on the type of application. There is no “magic bullet” that will describe this. There is, however, a migration guide, developed between ArtinSoft and Microsoft, that has a chapter on testing the applications. 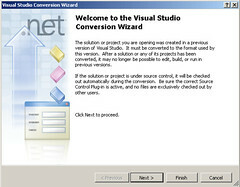 This can be found at Upgrading Visual Basic 6.0 Applications to Visual Basic .NET and Visual Basic 2005. ArtinSoft also recomends using a slightly modified version of the original application’s test cases. Question: What version of the .NET Framework is required for the migration tool? Answer: The Upgrade Wizard is available for version 1.0, 1.1 and 2.0 of the .NET Framework. We are currently using the version bundled with Visual Studio .NET 2005, that uses version 2.0 of the Framework, because it is the most recent version. Remember to check out all the VB to VB.NET presentations, that can be found at the CEM website. Tomorrow I'll be doing the final Webcast in a series about migrating from Visual Basic 6.0 to Visual Basic .NET. This one will be about tecniques on how to migrate common objects in Visual Basic (some controls, database access, forms, etc), and about recommendations on how to test a migrated application. Por qué considerar un proyecto de migracion de Visual Basic 6.0 a .NET? In the next few weeks I'll be doing several webcasts for Microsoft Latin America. They are about Visual Basic 6.0 to Visual Basic .NET migrations, and will be given in spanish. The first presentation will be this Friday, and it is called Why consider a project to upgrade from Visual Basic 6.0 to Visual Basic .NET?. In this presentation, we'll talk about the business and technological factors that influence the decision to upgrade an application. The second one is about Understanding the Upgrade Wizard, in which we'll talk about the process of upgrading an application from Visual Basic 6.0 to Visual Basic .NET. Some other webcasts are planned, but there's no date assigned yet. As soon as there is, I'll post all the information here.